With SilverSneakers, you don’t just get fitness classes—you get fitness classes led by certified instructors who specialize in working with older adults. Not all fitness programs for older adults are equal. Many programs give you access to gyms and exercise classes. With SilverSneakers, you’ll get that. But you’ll also find fitness classes designed for older adults—and led by certified instructors with special training. All at no cost to you! SilverSneakers instructors go through an extensive certification that makes them uniquely qualified to work with older adults, says Julie Logue, M.P.H., national trainer at SilverSneakers. The two points of emphasis for exercise: safe and effective. The goal of a SilverSneakers class isn’t to make you break a sweat. It’s to help you move through life. 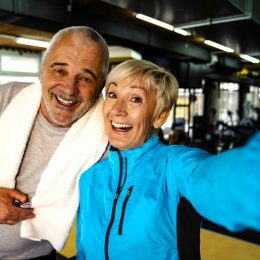 “Stronger muscles and better endurance can make it easier to carry groceries, work in the garden, and even play with your grandchildren,” Logue says. Here’s what our certified instructors learn that other exercise pros may not know. SilverSneakers instructors are taught the common conditions and limitations older adults may experience. For example, bones lose density and strength as we age, so we’re more prone to fractures over time. In addition, normal wear and tear can also cause pain and inflammation in the joints, which makes them less flexible. For those reasons, SilverSneakers instructors teach you how to move smoothly and under control whether you’re moving to music, lifting weights, or using resistance bands. You’ll avoid quick starts and stops during exercise to limit unnecessary stress on your bones and joints. If you’re dealing with a chronic condition or have some movement limitations, our instructors know how to modify exercises so they’ll be safe for you. If you have high blood pressure, for instance, you’ll be coached to slow down your breathing while lifting weights, which can slow your heartbeat, improve your blood flow, and stabilize your blood pressure. Have issues with balance? You have the option of using a chair for support in many classes. SilverSneakers instructors are taught how to cater to the needs of members at very different places in their fitness journeys: gym regulars looking for a new challenge, people who’ve never taken an exercise class, and folks who have chronic conditions or movement limitations. Of course, you’ll want to talk to your doctor before starting any new exercise program. But the good news is that exercise is safe for almost everyone—and a critical part of managing chronic conditions. Studies show that people with arthritis, diabetes, heart disease, osteoporosis, and depression benefit from regular physical activity. In fact, exercise can help you avoid some of those conditions. Regular workouts might also protect against dementia and Alzheimer’s disease. Balance problems often occur as we get older because of bone, joint, muscle, and inner ear changes. Each year, about 3 million older Americans go to the emergency room because of fall-related injuries, according to the Centers for Disease Control and Prevention. SilverSneakers classes incorporate exercises to help prevent falls: knee raises, side leg raises, and balancing on one leg. There’s even a class that focuses on balance skills: SilverSneakers Stability. SilverSneakers instructors are also trained to break down workouts into small segments, Logue says, and rehearse them slowly until everyone feels comfortable. Already had a fall? Ask your doctor these six questions for a safe recovery. Some workouts put older adults at greater risk of injury than the general population. SilverSneakers instructors are given specific exercise recommendations to avoid sprains, strains, and other issues. For example, when you’re working out in a seated position, your instructor will ensure you don’t bend too far forward or back because that can cause lower back pain. And they’ll skip any movement that places the head below the heart for a prolonged period of time because that can cause a drop in blood pressure and dizziness. In addition, when you do exercises that involve the hips or shoulders, your instructor will lower the number of repetitions to reduce your risk of injury. SilverSneakers instructors aren’t drill sergeants. They lead classes in a positive, supportive way so members leave feeling empowered. Participants are also encouraged to support one another—and they do. In fact, members often become great friends and get together outside of class too. Next PostYour Thanksgiving Plan to Stay Healthy, Stress Less, and Have Fun!